Lesvos or Lesbos. The island of harmony and unspoiled beauty, lying just off the coast of Turkey. The most sun - clad part of the Aegean. Perhaps nowhere else in the world has nature been as generous as with Lesvos. A beautiful silver green overlay, made up of pine, olive and oak trees, covers a large part of this land. It is an astonishing contrast to lush splendour of the rest of the cosmopolitan islands, with its mysterious forests, unique coastline, tranquil sunsets, rugged mountains, scattered hot springs, with their effective therapeutic qualities and the unique Petrified Forest! Two gulfs (Kalloni and Gera) define its unique shape among all the Greek islands. 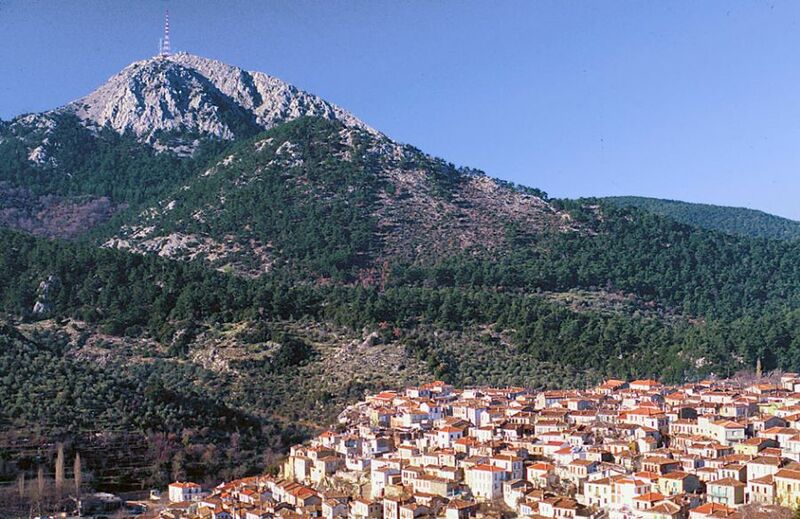 This is the 1630 km2 island of Lesvos (the third largest island in Greece). 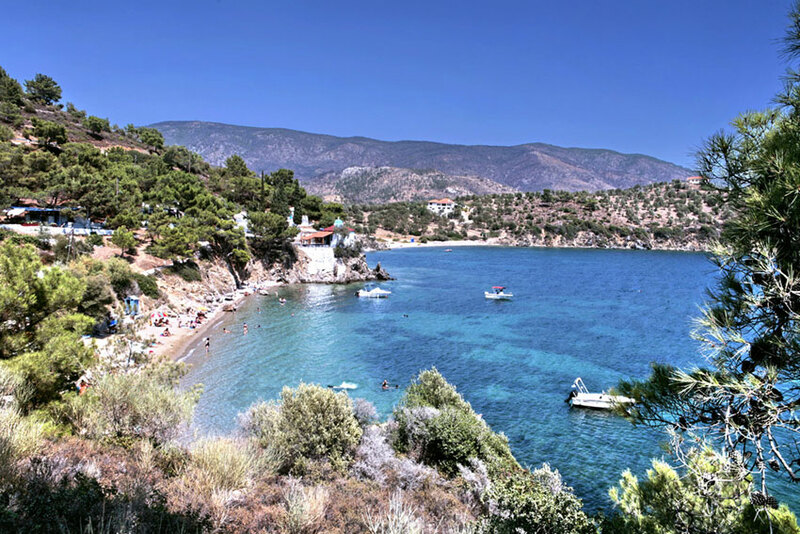 The enormous sheltered bay of Kaloni has several beaches. The most popular is the Skala Kaloni Beach which is a resort style with umbrellas, beach chairs, cafes and restaurants. There are numerous beaches in the Gulf of Yera also. 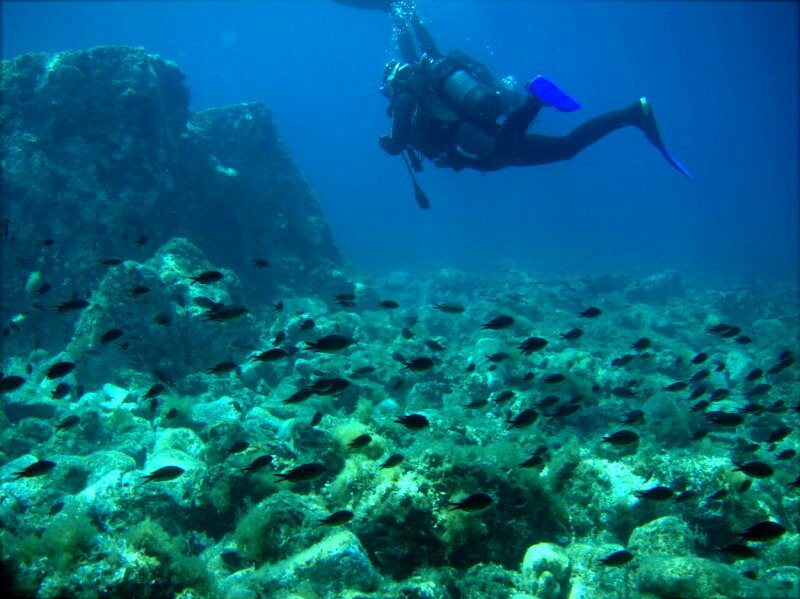 The sea is usually shallow and the views are gorgeous. During the summer you can most enjoy the Evriaki Beach. But there are several other beaches all round the island’s coast, where you can spend unique summer moments. Eresos beach. If you are planning to stay at Skala Eressos for your accommodation in lesvos, you will have the chance to swim in one of the most beautiful beaches in Lesvos. This is a place you will certainly enjoy crystal clear sea water , a magnificent sandy beach, and a lot of water sports, like windsurfing and waterskiing. 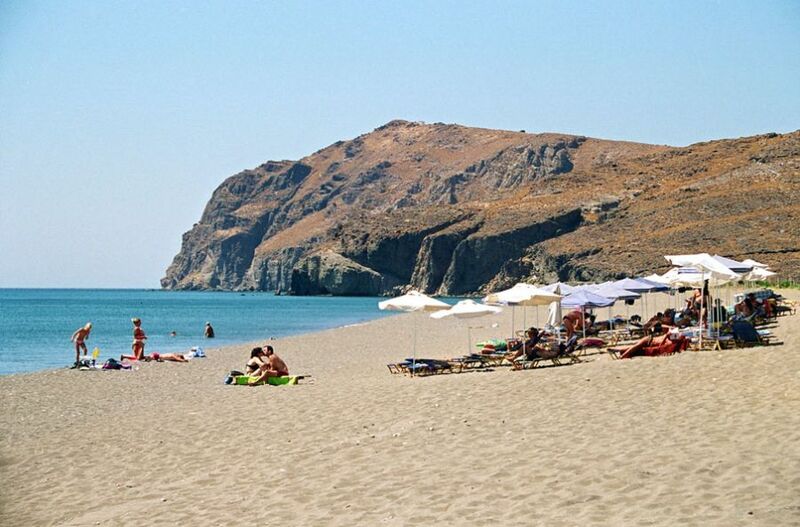 From all the beaches in Lesvos, Eressos beach has been distinguished by the E.U. Authorities as one of the most beautiful and clean beaches of Greece. You can enjoy lunching or dinning at the seaside restaurants savouring local specialities or taking your evening drinks in the cozy bars along the beach. Vatera beach. Is a 8-kilometer long sandy beach in the southern part of Lesbos island. It is 55Km in total from Mytilene. Vatera's endless stretch of beach, lapped by the clear waters of the Aegean, has been repeatedly awarded the blue flag of the EU for its clean, unspoiled beach and water. It is an ideal spot for swimming, sailing, all sorts of water sports, fishing and boat excursions. The region is also endowed with great natural beauty, making it ideal for trekking on foot through the verdant landscape. Several family hotels and taverns with traditional tastes are across the biggest beach on the island. Agios Isidoros beach, with it’s unique pebble is located two kilometers from the capital of ouzo «Plomari» inLesvos island. The name was given to the beach from a nearby church called St. Isidoros. It’s been voted in an online poll about “Clean Beaches” as the seventh best beach in Greece. The Organization of Protection of Nature and FEEE have been voting the beach since 1992 and given it the right to have the Blue Flag of European Community, waving on the beach. Petra beach. 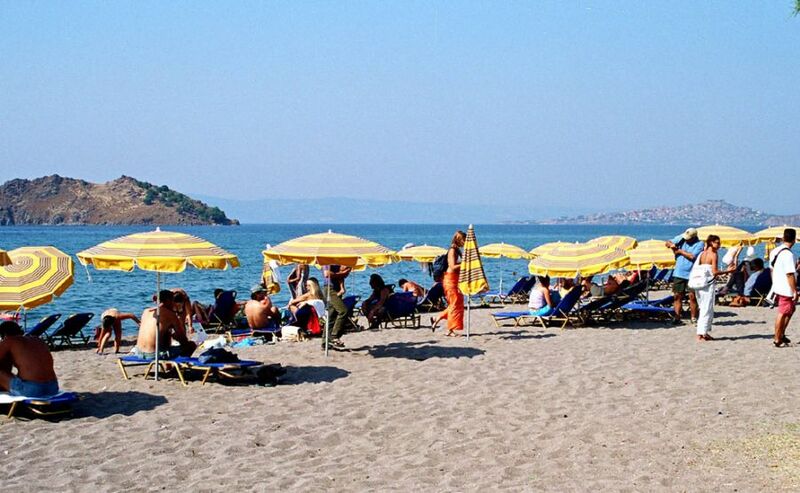 This large, well organized sandy beach is a nice resort located 55 km from Mytilene, in front of the same name village. Umbrellas, sun beds, shower and other facilities are available on the beach. There are various restaurants and fish taverns also, serving fresh fish and traditional dishes for the taste lovers. You can easily discover there hotels or rent rooms for your stay. Sigri beach. The beach at Sigri is long, sandy and shallow. It's in a sheltered bay and there are some tourist facilities. Nice view of the castle from the beach. Great for families with children. You can find nice restaurants, cafes and plenty of cheap hotel rooms available at the Sigri area also. Skala Kalloni beach, attracts plenty of summer visitors. The beach is big and sandy and the water is shallow. It tends to be very calm as the gulf mouth is narrow and the bay well protected. There are several restaurants built along the shoreline and several more to be found in the centre of the resort, along with minimarkets, hotels, tourist shops and so on. Agios Ermoyenis beach. The beach at Agios Ermoyenis near Mytilene could be the most beautiful beach of all. It is small and gets crowded in August and on weekends. As usual there is a traditional tavern just on the beach! There are some facilities also (shower). Kanoni beach- Pirgi Thermis. It is near the village of Thermi and characterized by its crystal clear waters and small pebbles. This beach is ideal for intense swimming. Gavathas beach. The sandy beach at Gavathas below Antissa is long and beautiful, surrounded by farms and green fields. There are also a few tavernas with fresh fish and cold beer. 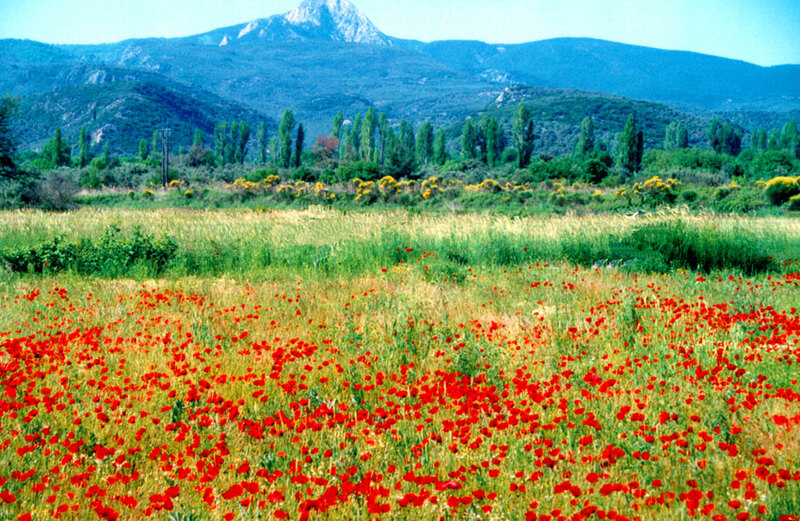 The soil and the climate of the island have given Lesvos an unusually rich flora to which it owes its beauty, the beauty that Sappho, the famous lyric poetess (6th century BC), sung. The Lesbian philosopher Theophrastus (3rd century BC), one of the forefathers of Botany, was the first to record a large number of plants. Today, 1.400 taxa (species and sub-species) of plants have been recorded on the island making Lesvos a “botanic paradise”: aromatic, pharmaceutical, ornamental and rare plants, bushes and trees. 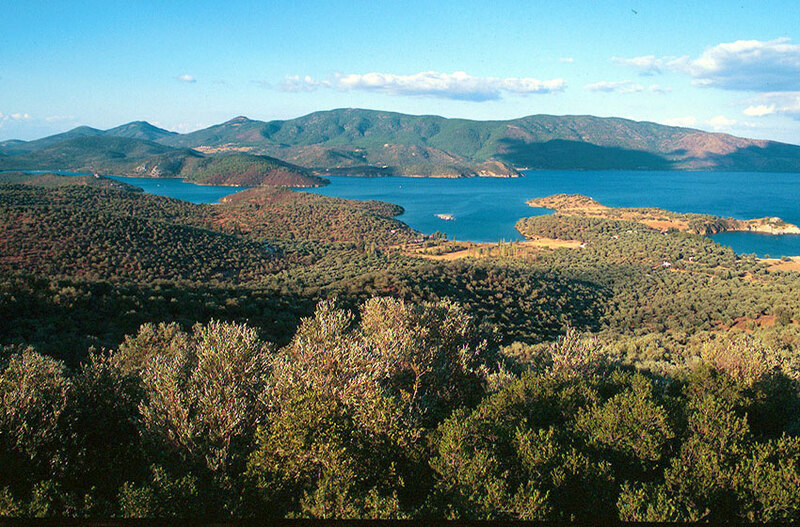 Although western Lesvos, with the exception of some small plains is barren, the eastern, southern and central parts are cloaked in olive groves (11 million olive trees) and forests of pine, chestnut, oak, beech and plane trees. 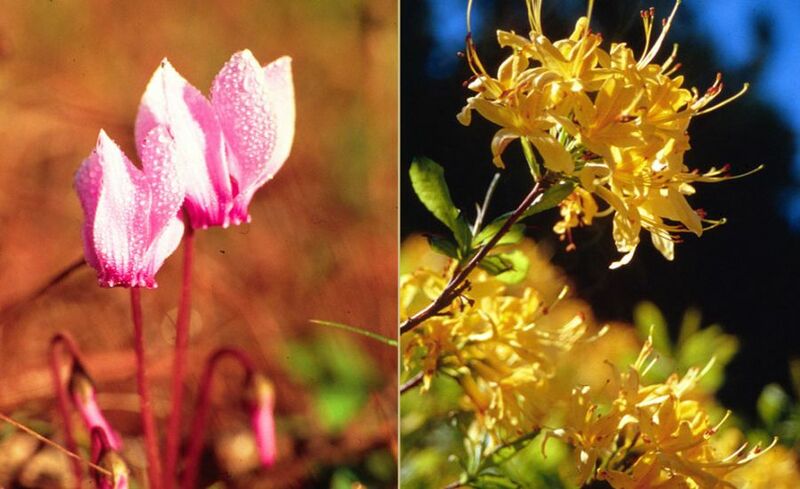 The Rhododendron Luteum Sweet is found only in Lesvos. It is a deciduous bush, with an average height of 4.5 m, with big, yellow flowers and lanceolate leaves. It grows in humid, clay and sandy soils at an altitude ranging from 60 m. to 799 m. (the top of Mt Profitis Ilias) above sea level. It is accompanied by the species: laurel (Nerium oleander), willow (Salix fragillis), arbutus (Arbutus unedo), fern (Pteris aquillina), ivy (Hedera helix), chestnut tree (Castanea sativa) and others. 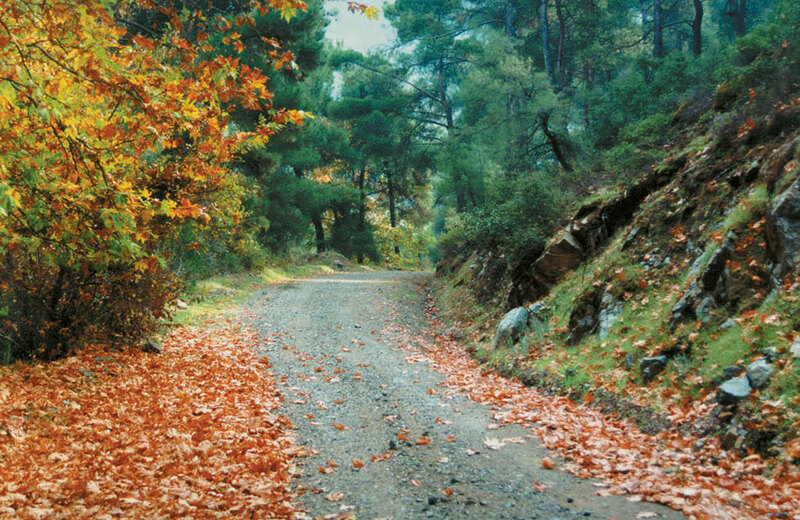 Of course the forests of Lesvos are the home of several small animals. Among them are squirrels of the species ”Sciurus Anomalus”, foxes, birds, like the very interesting partridge ”Alectoris Chukar”, and others. There are several species of snakes but only one poisonous species, the ”Vipera Xanthina”. A very interesting ecosystem is the Wetland of the Bay of Kalloni which includes the bay itself and a large number of wetlands: the saltpans of Kalloni and Polychnitos, salt plains, streams and their mouths, reed thickets, pine forests and olive groves. In the wetlands of the bay alone, 134 different bird species have been recorded several of which are migratory. Its many interesting inhabitants include storks, flamingos, kingfisher, the tringa totanus, a fidgety bird who at the slightest sound flies into the air arousing the other birds along and the avocet a bird with tall legs and an upward turning beak. In the recent years birdwatching facilities have been constructed while the number of persons visiting Lesvos in order to watch the birds has also increased.